Entrée: EUR 10-20. Delicious northern German fare, outstanding pancakes and pastries. The restaurant with a bakery/café is located in an old Frisian house and has a beautiful garden where you can relax from a bike tour over the island or enjoy a warm summer evening. Entrée: EUR 5-15. Gosch is one of the most popular fish restaurant chains in Germany and originated in List. The rustic and simple restaurant with its maritime atmosphere is a tourist magnet but definitely worth a visit. 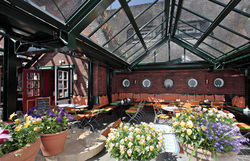 Try the super fresh fish rolls, fish dishes or oysters and have one bottle of the restaurant’s signature wine with it. Entrée: EUR 10-25. This simple beach shack is known for its beautiful location at the tidelands and for its Currywurst (curry sausage). Besides Currywurst you get fresh fish and seafood. ​Within Westerland along the beach promenade or at “Friedrichstraße” and the side alleys you will find several restaurants to choose from. Plus there are several Gosch locations in Westerland and Wenningstedt. Entrée: EUR 25. Lovely restaurant with a cozy and rustic atmosphere away from the town’s hustle and bustle. The overgrown reed thatched Frisian home has a beautiful patio with roofed wicker beach chairs where you can enjoy summer evenings. Entrée: EUR 15-30. Beach restaurant with scenic views over the shore and perfect to watch the sunset. The menu is based on local organic produce and mainly consists of delicious fish dishes. Snacks and pies: EUR 4-12. The copper pot is famous for its outstanding homemade pies, Frisian teatime and lovely setting. The former bunker and artist home has many corners and alleyways that are decorated with cozy seating areas. From the patio you have a beautiful view over the pine forest and the shore. Easy to combine with a bike tour to/from List. Pies: EUR 5. This lovely Frisian house and tearoom reminds of a cute little dollhouse. 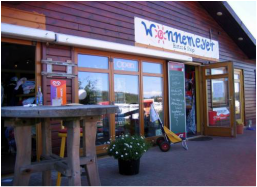 It is open during day and serves breakfast, tasteful homemade pies, cakes and typical Frisian tea. Entrée: EUR 15-25. This restaurant is located in the oldest tavern in Keitum and still has the original Frisian wall tiles inside. The menu includes venison, lamb, fish, and local produce only. Closed on Wednesdays. Entrée: EUR 10-15. Rustic wine bar that is located in an old Frisian farmhouse close to the cliff line. Besides a wide variety of wines you get delicious meat and cheese plates and French flatbreads which you can enjoy with the beautiful views over the shore. Entrée: EUR 20-30. 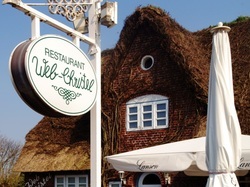 This restaurant is located within the sand dunes of Rantum and very popular with the German high society and wannabes. A visit at night can be very entertaining if you like to watch people. The Sunday brunch is famous and the menu consistently delicious. Make sure to make a reservation in advance. Entrée: EUR 15-25. 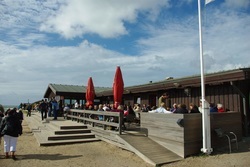 This beach restaurant is located in the dunes of Rantum and known for Mediterranean inspired fish and seafood dishes. Although the view isn’t spectacular like the one at Sansibar the atmosphere is nice.